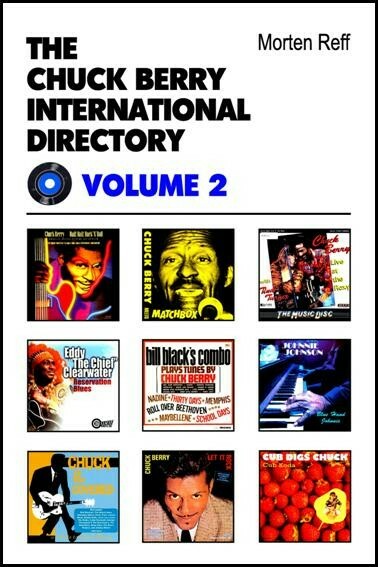 Chuck Berry International Directory - Volume 2 NOW OUT! THE CHUCK BERRY INTERNATIONAL DIRECTORY (VOLUME 2) by Morten Reff is now out! (VOLUME 2), please email music.mentor@lineone.net for a quotation. (VOLUME 2), please contact Gazelle Book Services - details below. Jerry Lee Lewis releases new record "The Killer" & kicks off European Tour! Jerry Lee Lewis is featured on T.G. Sheppard's new album "Partners in Rhyme". Jerry Lee's contribution is a newly written song: "The Killer". Order the album and preview a video clip and sound clips at www.22nashvillefriends.com. new album and his upcoming European Tour which kicks off tomorrow at London's 100 Club. When it comes to cutting people out of the Chess story, the rival "Who Do You Love" film has its own issues. The biggest-selling artist in Chess history is Chuck Berry, but his character was cut out of the movie. Why? Because the filmmakers couldn't make a deal for the rights to his music. The film's producer, Les Alexander, explains: "We made Chuck a spectacularly generous offer, but he wouldn't let us have anything. Our director, Jerry Zaks, even sent him a genuine fan note, saying how much his music meant to him. But it didn't matter--the answer was no." Berry, who is still active as a touring act, is notoriously difficult when it comes to business matters. When Taylor Hackford, who directed the wonderful Berry concert film "Hail! Hail! Rock and Roll," recently ran into the performer, the first words out of Berry's mouth were, "You still owe me money." Mos Def plays Berry in "Cadillac Records," which managed to acquire some Berry songs that are owned by Marshall Chess. But dealing with Berry was so unbelievably arduous that when I asked the film's producer, Sofia Sondervan, about working with him, she replied in a hushed tone: "I can't talk about it. I can't say anything about Chuck Berry at all." Fats Domino new documentary "Walking Back To New Orleans"
Fats Domino: Walkin' Back to New Orleans"
Includes a screening of the documentary, open bar, food, and live entertainment. Presentation begins at 6:30pm at Tipitina's Uptown, 501 Napoleon Ave. Call (504) 895-8477 for tickets, or go to www.tipitinas.com. There are a limited amount of tickets so purchase yours today! Both Legends will team up in November for a Tour which takes them all over Europe! There has been a change to the line-up of Chuck Berry's Band for November. IMPORTANT UPDATE: Chuck Berry & Jerry Lee Lewis European Tour confirmed! PLEASE NOTE THAT LINDA GAIL LEWIS WILL REPLACE LITTLE RICHARD, WHO WAS FORCED TO CANCEL HIS EUROPEAN TOUR DUE TO ILL HEALTH, ON "LEGENDS OF ROCK'N'ROLL" SHOWS IN ZURICH AND PARIS! REFUNDS WILL BE OFFERED TO THOSE WHO DO NOT WANT TO ACCEPT THIS REPLACEMENT! LAST BUT NOT LEAST, A BIG THANK YOU TO BAUKE ALGERA FOR SAVING THIS TOUR & KEEPING US INFORMED ABOUT ITS DEVELOPEMENT! THANK YOU, BAUKE! 13.11.08 - Moscow, Russia - B-1 Maximum REFUNDS NOW AVAILABLE AT POINT OF PURCHASE! 16.11.08 - Villach, Austria - Stadthalle REFUNDS NOW AVAILABLE AT POINT OF PURCHASE! 17.11.08 - Salzburg, Austria - Salzburg Arena REFUNDS NOW AVAILABLE AT POINT OF PURCHASE! Rock icon LITTLE RICHARD recently underwent an emergency heart procedure after falling ill ahead of a hip replacement operation. The 75-year-old began suffering chest pains on 9 September (08) as he prepared to go under the knife in Los Angeles for the planned surgery prompting doctors to cancel the hip replacement and perform an angioplasty, to widen a narrowed or obstructed blood vessel. A friend tells the National Enquirer that the star - real name Richard Wayne Penniman - was too scared to go through with the hip surgery, and flew home to Tennessee. The pal says, "Richard's been in poor health for a while. He can barely walk, often uses a wheelchair and uses an oxygen tank to help his breathing. "The morning of surgery, Richard began suffering chest pains and the hip surgery had to be cancelled. Instead of doctors working on his hip, he had angioplasty." A representative for the star confirmed Richard's health scare, and revealed the hip surgery has been rescheduled for November (08).